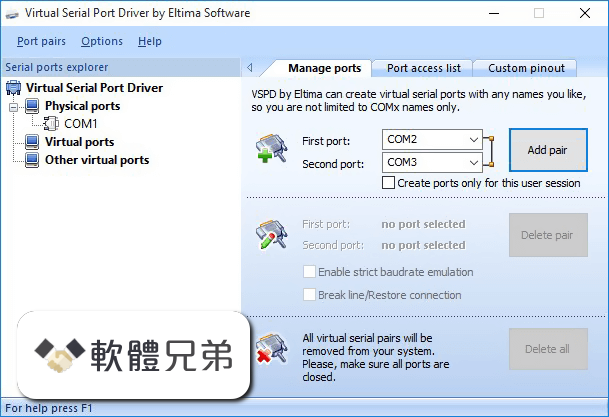 Virtual Serial Port Driver 為您提供創建無限數量的虛擬串行端口的能力。創建的端口位於“設備管理器”的“端口”組中，這意味著它們將被您安裝的所有軟件和硬件顯示並輕鬆識別。您將能夠設置哪個應用程序有權訪問定義的端口。沒有真正的硬件串行端口被佔用. 由 Virtual Serial Port Driver 創建的虛擬端口與真實端口完全一樣。他們模擬所有真正的串行端口設置，並提供嚴格的波特率仿真和全面的 HandFlow 控制支持。另外，您可以輕鬆地模擬串行換行符。而且，VSPD 採用先進的 Windows 內核驅動技術，確保 WDM，WMI，電源管理，PnP 等的支持。 Virtual Serial Port Driver 與 API COM 完全兼容，支持所有的 Windows 消息. 使用 Virtual COM Port Driver 創建的虛擬串口模擬和支持所有標準硬件信號線（DTR / DSR，RTS / CTS，RING，ERROR，DCD 等）。 ）。與實際的虛擬調製解調器連接一樣，本地端口的 DTR 連接到遠程端口的 DSR 和 DCD，本地端口的 RTS 連接到遠程端口的 CTS。此外，您可以選擇環回引腳或根據您的硬件配置創建自定義的一個. - Added: possibility to create ports for the current user session only. Allows RDP users to create port with the same name (e.g. COM1) in each user session.